Arc'teryx Bottoms Size Chart Arc'teryx Tops Size Chart For a high degree of warmth without extra weight, the Cerium SL Jacket offers lasting midlayer performance when there are miles left to trek. Trim Fit:• Motion-friendly fit reduces fabric for minimal bulk.• Tailored, midlayer fit. SL: Super Light uses ultralightweight materials, improving packing and wear while reducing bulk. Thisela™ fabric:• 7D ripstop taffeta features a high strength-to-weight ratio.• Smooth face moves easily under top layers.• DWR (durable water-repellent) finish.• 0.6 oz/yd²; 20 g/m². Down Composite Mapping™ design:• Targeted synthetic insulation reduces moisture retention high perspiration zones.• Coreloft™ 100 (100 g/m²) and Coreloft™ 40 (40 g/m²) siliconized polyfill in a compressible, multidenier construction.• 850-fill, European grey goose down offers a high warmth-to-weight ratio. Compressible design packs away easily into a stuff sack. Stand collar with zipper garage. Full zip. Zip hand pockets. Elastic cuffs. Droptail hem. 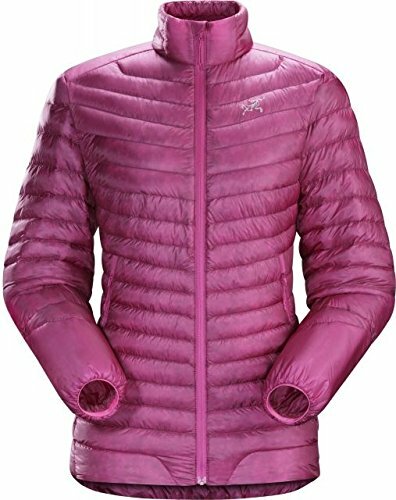 Shell and Lining: 100% nylon;Body Insulation: 100% grey goose down;Synthetic Insulation: 100% polyester. Machine wash and tumble dry. Imported. Measurements: Length: 24 in Sleeve Length: 32 in Product measurements were taken using size SM. Please note that measurements may vary by size. For a high degree of warmth without extra weight, the Cerium SL Jacket offers lasting midlayer performance when there are miles left to trek. Trim Fit:• Motion-friendly fit reduces fabric for minimal bulk.• Tailored, midlayer fit.